For your Tweetfest convenience, a collection of examples of women killed by safe-n-legal abortion quackery, noting that there is indeed a need for a national dialog about, and approach to, abortion in order to improve women's health and well being. That's something we agree with the Feminist Majority Foundation about! 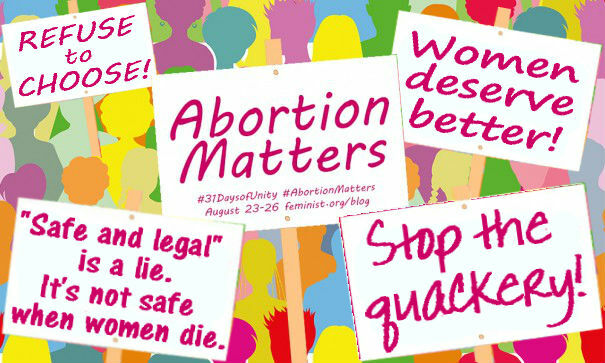 #AbortionMatters BCuz #prochoice rally in favor of quacks who kill women via #abortion. We need neutral oversight. Cancer pt. 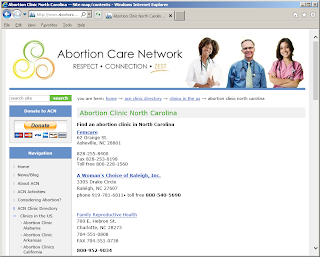 lied to, tricked into fatal #abortion. No #prochoice outrage. We need national dialog. #AbortionMatters! #AbortionMatters: Let's Embrace Their Goals! Here's the "Feminist Majority Foundation" page announcing the #AbortionMatters" "blog carnival." 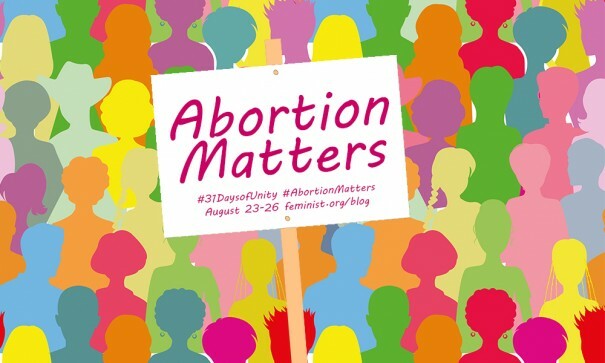 #AbortionMatters will showcase various personal essays and short policy pieces that stress the importance of a federal – and wholly national – approach to abortion. In an effort to destigmatize abortion, encourage wider education on the procedure, and normalize the conversation, we’re gathering stories to illustrate the complexity and unique experiences which shape the pro-choice movement and demand greater action. Pieces should stress / mention why a cohesive, national approach to abortion issues and decisions leads to better healthcare and well-being for women. 1. 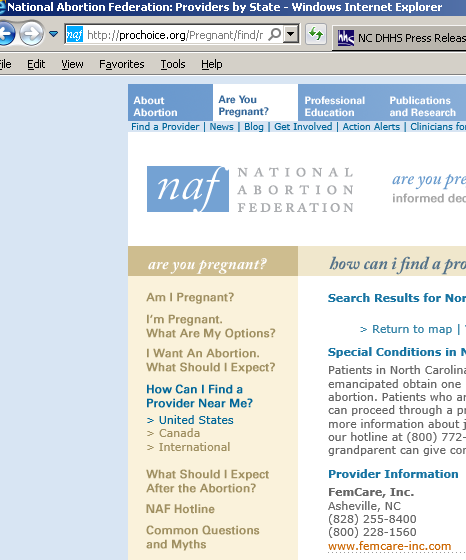 I agree that there does need to be "a federal -- and wholly national -- approach to abortion." After all, the 14th Amendment specifically says that "no person shall be deprived of life, liberty, or property without due process." Legal abortion creates an entire class of people who can be deprived of life without due process, and thus is clearly unconstitutional. 2. We do need to "encourage wider education" on abortion procedures. People need to be made aware of exactly who is being destroyed, and how, and why. 3. "A cohesive, national approach to abortion issues and decisions" would indeed lead to better health care and well-being for women. A pregnant woman facing challenges should be offered help and support, not turned over to people who will scrape her out then shove her out the door to bleed and vomit in the parking lot. Not to mention the adverse effects of abortion on women. 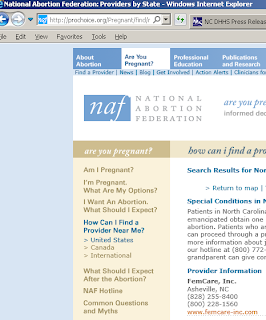 Of course, they add the "destigmatize" abortion. Gosh, it turns out that slaughtering your own children is still considered a shameful thing. Who woulda thunk it? We don't need to make abortion acceptable; we need to make it unthinkable. And if we keep pounding away at the three points, the things that FMF claims they want to do, we can get people to start asking why anybody would want abortions to be tolerated at all. So let's get going! Go on and read the rules. Write and submit those blog posts! Submit them to the FMF, AND to me here! The email address is socialmedia@feminist.org. Put the links to your blog posts in the comments and I'll keep updating the list of entries that were submitted to FMF. Let's have that national dialog, shall we? 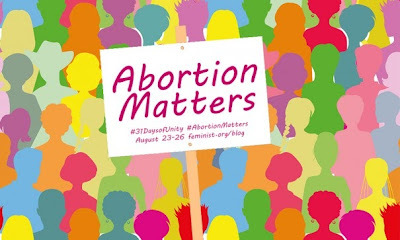 The "Feminist Majority Foundation" is holding an "#AbortionMatters blog and tweetfest from August 23 through August 26. 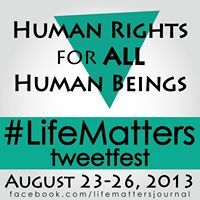 Prolifers are responding with a corresponding "#LifeMatters" blog and tweetfest on the same dates. Of course, if you know me, you know that I'll be joining #AbortionMatters with messages to get people past the idea that if they don't plan to avail themselves of abortion, it doesn't effect them. Women who face health problems during wanted pregnancies and end up not being offered life-affirming options. Women who face a prenatal diagnosis and are pressed to abort their wanted babies. Family members who lose wanted children, siblings, grandchildren, nieces and nephews to abortion. Men who marry post-abortive women and then are left to help their wives through the damage that an abortion has done. Bystanders who end up caught up in the drama of a woman collapsing from a botched abortion. I'm also open to other suggestions of how abortion matters, even if you think it doesn't impact you. 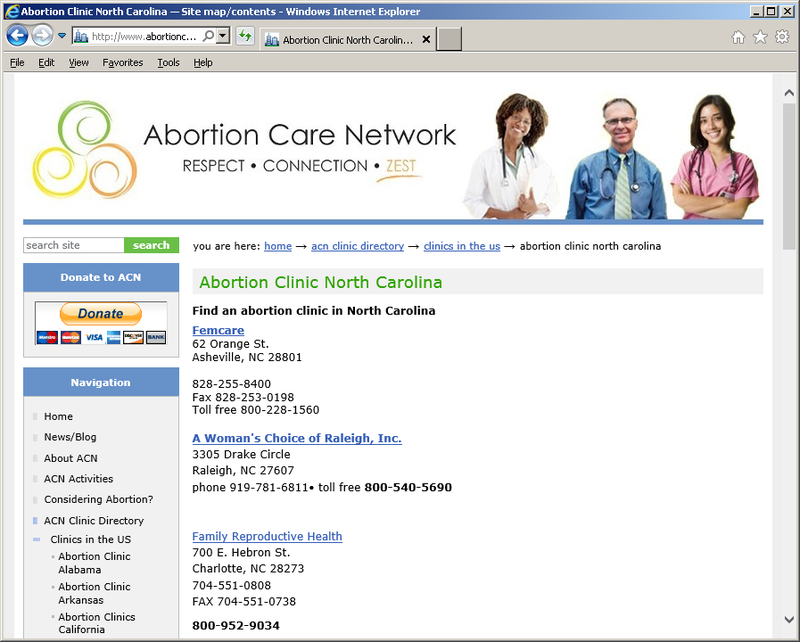 Raleigh, N.C.-In response to inquiries, the Department of Health and Human Services confirmed today that it has suspended the license of a medical clinic in Asheville, N.C, which specializes in abortions. After a routine survey of FEMCARE, Inc., inspectors found egregious violations of existing rules that revealed an imminent threat to the health and safety of patients. Failed to maintain anesthesia (nitrous oxide gas) delivery systems in good working condition, with torn masks and tubing held together with tape.This could lead to patients not receiving the intended dosage and risk patients not being fully sedated during surgical procedures, leading to pain and physical harm. Failed to ensure emergency equipment had weekly checks to ensure the equipment was suitable for use in patient care and failed to ensure that emergency medicine wasn't expired. Failed to have a resuscitator available. Failed to sweep and mop the operating room floor and failed to properly clean operating room beds. Failed to have a director of nursing responsible and accountable for all nursing services. Failed to have an agreement/contract with an anesthetist or anesthesiologist. Failed to have an agreement/contract with a registered pharmacist to assure appropriate methods, procedures and controls for obtaining, dispensing, and administering drugs. 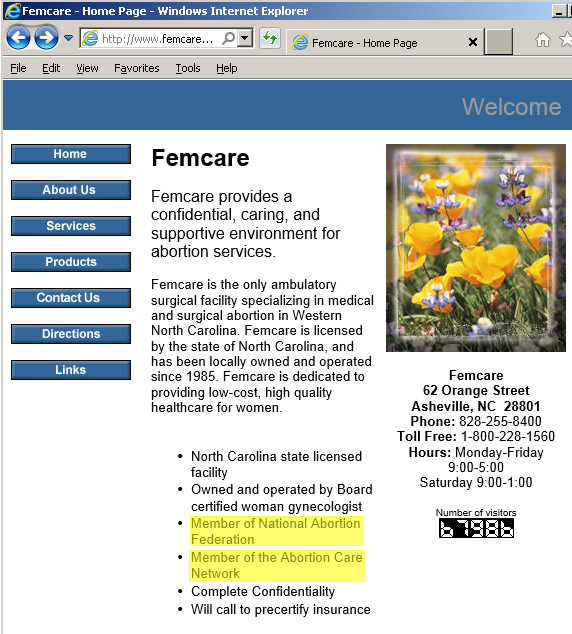 FemCare is a member of the prestigious National Abortion Federation (see listing here), which purportedly provides the safest and highest quality abortion practitioners. However, one National Abortion Federation clinic allowed notorious abortionist and convicted murder/admitted drug dealer Kermit Gosnell to begin illegal third-trimester abortions on their premises and complete them in his Philadelphia "house of horrors," where they were doped within inches of their lives by amateurs and left to moan on bloody recliners amid the fleas and cat feces. 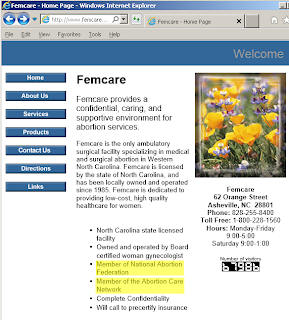 FemCare is also a member of the Abortion Care Network, another organization that purports to refer women to safe and high-quality abortion facilities. So much for the idea that prochoice organizations can be trusted to oversee abortion practitioners and to refer women to places that won't endanger their lives.